What’s better than a slushie? 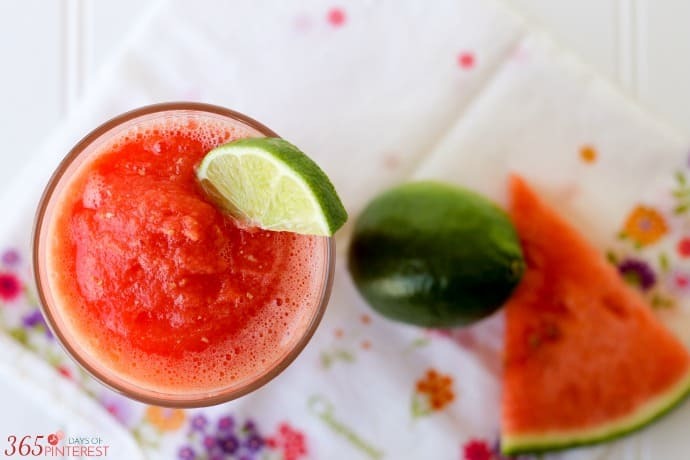 A SPARKLING Watermelon Slushie that won’t mess up your clean eating lifestyle because it’s simply perfect. I’ll admit it. My life pretty much revolves around food. I think about it when I wake up in the morning, I spend my days preparing it for the family, and now I make a living making/photographing/writing about it. I celebrate with it (Earthquake Cake, anyone?) and I mark the passing of the seasons with it. Growing up, I actually wasn’t a huge fan of watermelon. It didn’t really taste like anything to me. I never hated it, but I just wasn’t a fan. As an adult, I appreciate it for it’s nutritional value and the fact that you can eat your body weight in watermelon for a grand total of 12 calories. Or something like that. I’m sure that’s very close. The other day I bought one of those personal sized watermelons at the grocery store. We cut it up for dinner and I put the leftovers in the freezer. 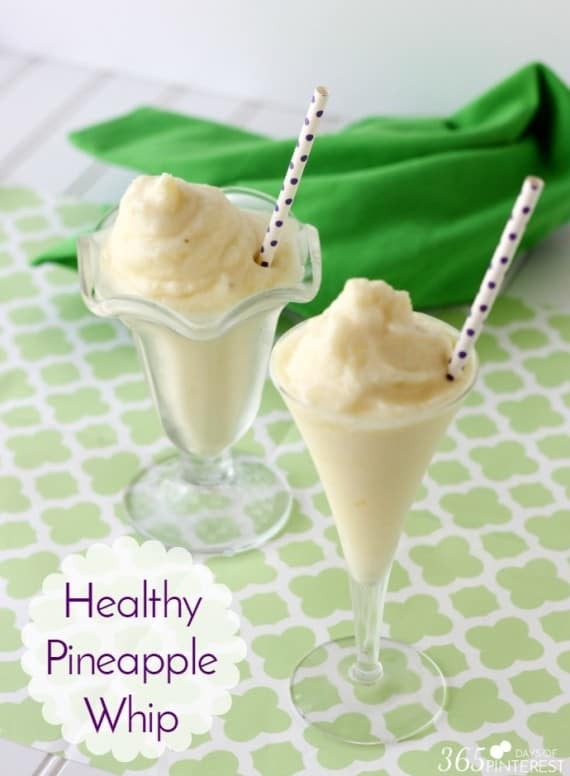 I wasn’t sure what to do with it, but I use frozen bananas for smoothies all the time, so I figured I’d toss them in my smoothies at some point. Then when I saw the berry-flavored sparkling water in my refrigerator, an idea hatched in my head and I knew I was on to something! 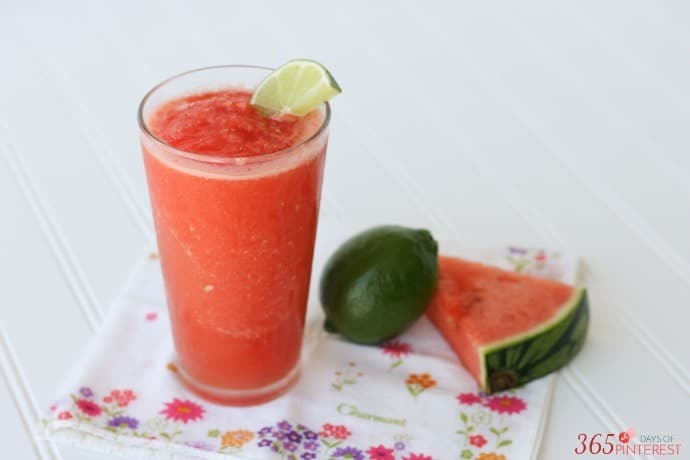 This refreshing Sparkling Watermelon Slushie is a much healthier option than ice cream on a summer night! 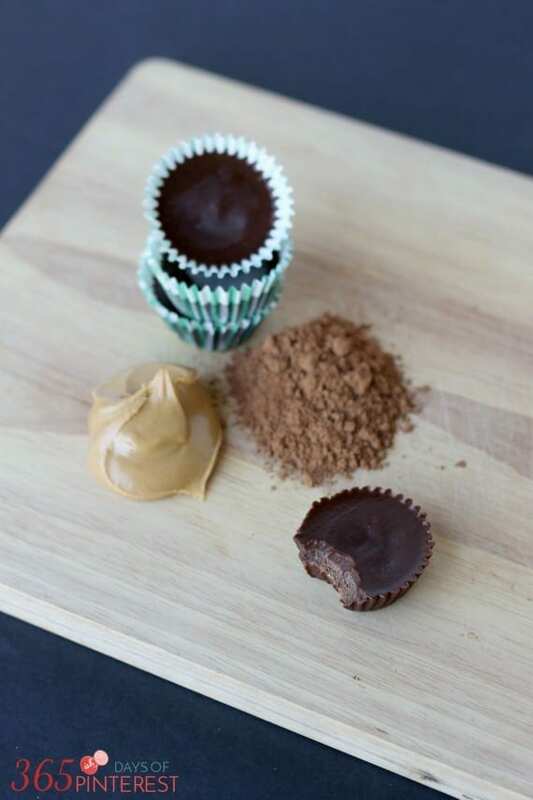 It’s clean-eating approved (and paleo and vegan and all that good stuff) and it doesn’t taste like cardboard. WIN! I didn’t even use any sweetener because the watermelon was already sweet and the berry water added another great layer of flavor. 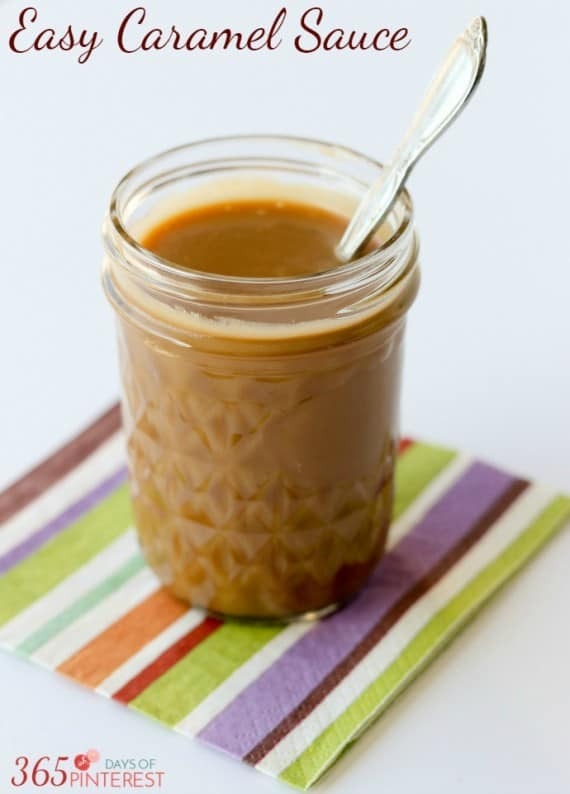 You could use honey or coconut palm sugar, though, if you wanted to amp up the sweetness. 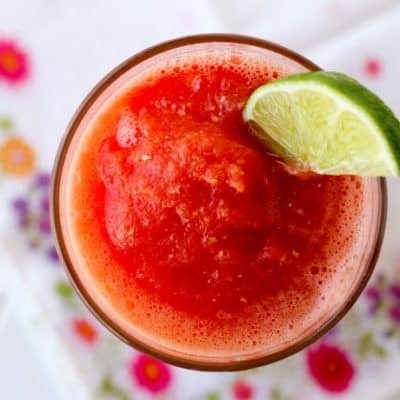 Add watermelon, lime juice and sparkling water (a little at a time) to the blender and mix well. 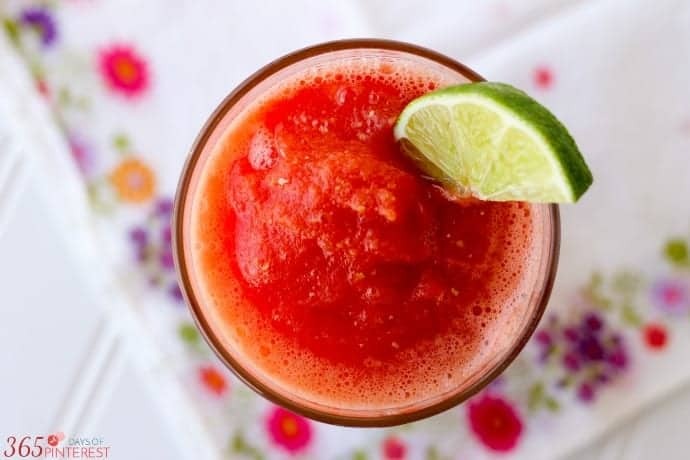 The nice thing about using frozen watermelon is the fact that you won’t water down your smoothie with ice! The more frozen the watermelon is, the thicker the smoothie will be. I made my first glass and it was very thick and icy like a slush. I had more in the blender that didn’t get used, so I put it in the fridge. Later that night, I poured another glass and it was thin like juice. It was delicious either way, so there’s really no “wrong” way to make this. It seems odd to pour a carbonated beverage into the blender, but it doesn’t get all frothy and foamy or anything. Just pour it in a little at a time until you get your desired ratio. Be sure to come back and tell me how you like it! 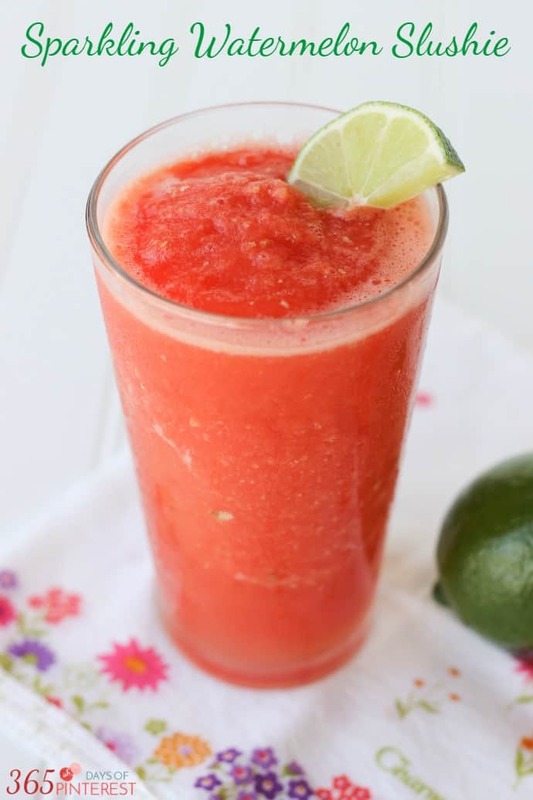 Check out these other clean eating “Fitness Friday” posts just like this Sparkling Watermelon Slushie! Anything you can sub in for the sparkling water? Any liquid would be fine- you just wouldn’t get the “fizz” that you get with sparkling water. Also, you may want a little more flavor, since the water I use is berry flavored. I think coconut milk would be really yummy! !